Here is another artist for my inspiration collection. 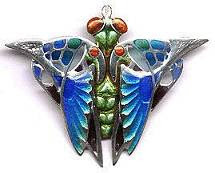 I have been doing a research on enameled jewellery in last few weeks. I am interested in Ceramit, that is basically a type of cold enamel. However, many of the hot enamel techniques may be applied to working with it (as well as those that are not available for working with hot enamels). I got very enthusiastic about the opportunities that Ceramit gave and created an enameling class where I could teach my students how to use it. I remember a few enameling artists whom I have found in Internet in last few years and who amazed me. One of them was Allan Heywood from Australia. This is his web-site. After visiting Australia myself (just a couple of months ago) I can understand where he gets his inspiration. Australia is an amazing country! Put an inspiration and a talent together and you can get a masterpiece.